I was so excited that my cousin dropped by after work tonight, and I wanted to make us a nice dinner. Our last CSA share was almost three weeks ago, and I haven’t been shopping since we returned from a long weekend away, so our kitchen stocks are sadly low (CSA share comes tomorrow, yay!). This was an evening where I needed to rely on my pantry and the pantry really delivered. I had a few of the right things and was able to create something delicious from nothing. I didn’t have any fresh greens except for a bit of soggy celery and a some parsley leftover from New Year’s Eve. To firm up the soggy celery, I just soaked it in cold water for 10 minutes (I use this trick for limp salad as well). 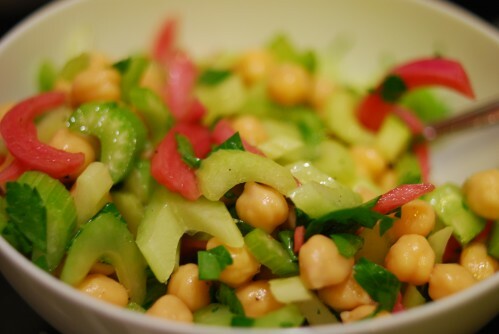 Then, I tossed the chopped celery with a can of chickpeas, some pickled red onions* (also leftover from New Year’s Eve), chopped parsley, extra virgin olive oil, red wine vinegar, salt and pepper. This is simply my type of pasta: garlic, olive oil and Parmigiano, with some frozen vegetables that I always have on hand thrown in for good measure. 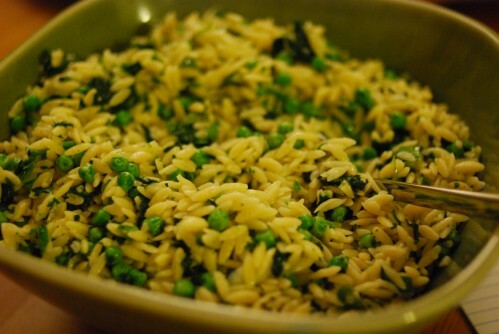 Sauté garlic in oil in a large pan, after a few minutes, add cooked orzo, peas, spinach and toss. Season with salt and pepper. Toss with cheese. *Pickled red onions from Thomas Keller, Ad Hoc at Home. Boil 1.5 cups red wine vinegar, 3/4 cup sugar. Pour over 2 sliced red onions in a quart jar. Cover for at least 24 hours, and up to a month. ← A Frittata and Latke, United at Last! I love when dishes made entirely out of “what the heck do we have left in the pantry?” come out so well! Great job. I found pickled red onions, yay! I know they’re easy, its just that all the recipes I have are for canning, so they are in quantity. And what is the CanJam? I like to can!